This ethnographic study contributes to the understanding of the widespread cultural (dis)attachment of Ecuadorian Quiteños from the Amazon rainforest by focusing on oil development in the region. While in recent years the international community has expressed interest in preserving the uniquely endemic areas of the Amazon, this study concludes that Quiteños have a strong cultural detachment from the Amazon. This study begins by providing a brief overview of the history and consequences of the oil development in Ecuador’s Amazonian regions. This study proceeds to analyze survey data and interview results conducted in Quito over a one-month period. Indicators of Quiteno’s cultural separation form the Amazon that emerge in this study include: overall partial to full agreement with oil development in the Amazon, the recurring idea of the “other” (Amazonian indigenous groups), lack of political involvement to preserve the Amazon, and opinions and skepticism regarding the Yasuní ITT Initiative. This study concludes by examining Quiteños’ unwavering hope for the younger generations to fight for the Amazon. This study contributes to the understanding of the cultural identification and (dis)attachment of Quiteños to the Amazon rainforest by focusing on oil development in Ecuador. Since its beginning in the 1960s and 1970s, oil development in the Amazon region of Ecuador has been a controversial and debated topic. After Chevron-Texaco deliberately dumped 18.5 billion gallons of toxic waste sludge into the streams and rivers of the Amazon between 1964 and 1992,1 and once President Rafael Correa popularized the Yasuní ITT Initiative, the international spotlight on oil development in Ecuador has grown stronger. There are many international and national actors involved in either the fight to progress or halt oil production in Ecuador. However, while all international eyes are on Ecuador, this ethnographic study has determined that Ecuadorians, especially Quiteños living in the nation’s capital, have a strong cultural detachment to the Amazon. By examining the structures of Quiteños’ cultural relationship and identification with the Amazon, this study aims to understand the powerful political and social role the oil industry plays in Ecuador. This study briefly discusses the environmental consequences of oil exploitation, ranging from deforestation and species extinction to climate change and increasing pollution to oil spills, as they are well documented and undeniable. Additionally, there exists an abundance of academic articles, journals, and books that cover the devastating impacts of oil production on Amazonian indigenous communities, especially those in the provinces of Orellana and Pastaza. However, there is virtually no literature regarding the public perception of Ecuadorians living in cities. In the small country, sharing approximately the same area as Wyoming, there exist many distinct and often contrasting worlds: the coast and endemic Galapagos Islands, the Sierra, the modernizing urban cities such as Quito, and the pristine Amazon rainforest which is home to indigenous people. This study focuses on the public perceptions of Quiteños relating to oil development, and more specifically the cultural attachment to, or detachment from, the Amazon. Since this study focuses on the public perceptions of Ecuadorians living in Quito regarding oil development in the Amazon, ethnographic methods are carried out in Quito. Quito was the selected site for this study because it is the capital of Ecuador where major environmental and social decisions are made and policies are crafted. To understand the public perceptions and cultural ties of Quiteños to the Amazon, multiple data collection methods are utilized. The majority of my analysis is drawn from eight interviews of Quiteños conducted from February 2013 to April 2013. This study has two major hypotheses: 1) Quiteños generally do not have a prominent cultural attachment to the Amazonian regions of Ecuador; and 2) Quitenos’ political involvement and advocacy to encourage the protection of Amazon is low. The rationale for these two hypotheses was generated from observations made during my five-month stay in Quito, where I noted a surprising lack of pride for and urgency to protect the megadiverse Amazonian regions of the country. I first wanted to know how educated Quiteños are regarding oil development in the Amazon. Therefore, the interviews begin by examining the interviewee’s general knowledge and opinions regarding the issue. Do people from Quito agree or disagree with the oil development in the Amazon and why? Other questions this study answers include: do Quiteños have a sense of pride for their megadiverse country? ; do Quiteños have a shared attachment or detachment with the Amazon? ; politically, do Quiteños prioritize the protection of the Amazon above/below other issues? ; who do Quiteños blame for the blatant neglect of the Amazon and its indigenous peoples? ; do people living in Quito have optimism for the Yasuní-ITT Initiative and/or alternative energies? In order to reach as many individuals as possible and to receive additional data, this study analyzes the results from an anonymous survey that was sent to eighteen Quiteños from varying socio-economic classes, ages, and genders. This survey was distributed as a hardcopy and electronically. The survey includes opinion questions regarding political prioritization of issues in Ecuador, and agree/disagree questions relating to oil and mining development in the Amazon, and to tourism’s effects on the rainforest. Target groups that received this survey include, but are not limited to, taxi drivers, business owners, and college students. Important results collected from the survey were then compiled into graphs and are featured within this study and in the appendix section. This study primarily targets the average Ecuadorian citizen living in Quito. However, in order to provide varying perspectives to the complex issue of Amazonian oil development, this study also includes other actors, such as a worker for a privately owned oil company living in Quito. Workers from the Tiputini Biodiversity Station located within the Yasuní National Park were also interviewed in order to provide first-hand witnesses to the consequences of oil development. The co-founder and director of the Station, Kelly Swing, was interviewed along with manager Juan de Dios. During these interviews, extensive field notes and written transcripts were taken. To fully understand the problem of oil development in the Northeastern region of Ecuador, one must understand the historically powerful role major oil companies have held and the ecological and cultural spheres they destroyed. This study also provides a brief explanation of President Rafael Correa´s unprecedented Yasuní-ITT Initiative. “Black gold” has transformed Ecuador economically, politically, and culturally, and in such a rapid and profound way that perhaps only the Spanish Conquest has had a comparable effect2. Studies on the history of Ecuador’s oil industry rarely neglect to examine the role of and case against Texaco.3 4 Ecuador’s history of development is marked by a reliance on the primary sector, from cocoa (1860-1920), to the Banana Boom (1948-1965), to the current extractive practices of the oil and mining industries.5 Between the different international and national actors and concessions from the government, the beginnings of oil development in the Amazon were convoluted and the means by which Texaco got involved have been said to be deceptive. 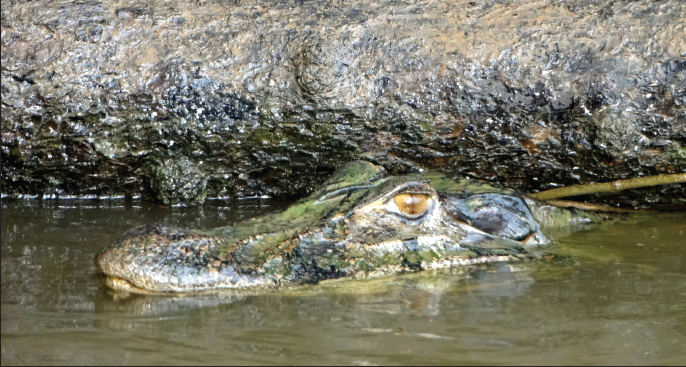 A black caiman (Melanosuchus niger) sighting while traveling across an Amazonian lagoon. Despite many progressive international initiatives to recognize and protect the world’s indigenous people, such as the UN designating 1995-2005 the International Decade of the World’s Indigenous People, Ecuador has sought to assimilate its indigenous populations of the Amazon into the oil economy. Furthermore, the Ecuadorian government has refused to recognize indigenous ownership to the land they have inhabited for centuries.29 Instead of assimilating, many indigenous groups in Ecuador have countered these assaults and encroachments by protesting in Quito to demand that their political, cultural, and territorial rights be respected, and oil development to stop. The Yasuní National Park has not been spared from environmental degradation. Despite its designation as a national park in 1979, The Ecuadorian government continued to promote oil development in Yasuní.34 Ecuador’s Amazon is geographically divided into oil blocks. Each block is sold to and owned and operated by foreign and domestic oil companies. As the demand for oil increases worldwide, more and more blocks are being carved out of the Amazon, some of which overlap with indigenous territories and protected areas like the Yasuní National Park.35 Additionally, due to the construction of oil roads, settlements, and resource exploitation in the Amazon, overhunting and contamination can occur virtually unrestrained. However, within the last decade, a considerable resistance campaign has emerged in Ecuador to counter the exploitation of the Yasuní National Park. In June 2007, Ecuador launched an unprecedented and innovative new initiative called the Yasuní-ITT Initiative. This initiative would leave at least 850 million barrels of heavy crude oil locked beneath the ground in order to protect biodiversity, respect indigenous’ territory, and combat climate change.36 Due to Ecuador’s deep economic reliance on the oil industry, it is offering to leave the oil fields of Ishpingo-Tambococha-Tiputini, or ITT, undeveloped if the international community can generate a minimum of half the estimated market value of the crude oil, or $3.5 billion.37 While this initiative has gained support and praise from the international community, many in Ecuador are skeptical of its potential for success considering Ecuador’s heavy economic reliance on the oil industry. As can be seen above, many different aspects of the oil development issue in the Amazon have been covered in previous studies and literature. However, virtually nothing has been documented regarding the public perceptions of Quiteños. Considering that crucial legislative decisions are made in the capital of Quito, and also taking into account that Ecuador is one of the most biodiverse places in the world, this study aims to make sense of the alarming lack of cultural and political attachment to the Rainforest amongst Quiteños in order to better understand the persistent, exploitative practices of oil development. Additionally, this study analyzes the skepticism that exists amongst Quiteños regarding the Yasuní ITT Initiative. After one month of surveying and interviewing in Quito, I have concluded that there does exist a strong cultural separation from the Amazon amongst Quiteños. In this section, I first analyze survey and interview results and identify indicators of this separation, which include overall agreement with oil development in the Amazon, the recurring idea of the “other,” lack of political involvement and prioritization of political issues, and opinions and skepticism regarding the Yasuní ITT Initiative. This study concludes by examining Quiteños’ hope for the younger generations. Juanito is a 41-year-old small-business owner, taxi driver, husband, and father of two who has lived in Quito for 37 years. Without any hesitation, he explained to me how oil development in the Amazon greatly affects his businesses in Quito, “when oil costs more, so does everything else,” including the food necessary to keep his restaurant open. He mentioned that without oil development, the new, and much safer, airport would not have been able to be built. Since Juanito’s businesses are dependent on low oil costs, he is in complete agreement with domestic and foreign oil development in the Amazon, as long as it is done legally, regardless of lax regulations and harm to the environment. Compared to the economic benefit oil development brings to Juanito’s businesses, irreversible environmental damages are nearly invisible throughout his daily life. Additionally, the idea of the “other” makes it easier for Ecuadorian students and employed adults to leave the country to take advantage of opportunities abroad, because they do not feel personally and culturally attached to the diversity they are leaving behind. Paula regrettably explained that the ultimate goal of most of the students at her university is to continue their studies abroad, even though “Ecuadorians should take advantage of all our country has to offer and help develop it.” However, a phenomenon exists where Ecuadorians have more pride for the Amazonian regions of their country once they travel abroad and have a chance to miss it, discovering its value. Juanito told me that his brother is a doctor in the United States who before did not appreciate the diversity in Ecuador. However, only by leaving Ecuador did he gain a renewed sense of pride for its diversity, and now deeply misses it. I asked all of the interviewed Quiteños to rank their top three political issues from most important to least important. Juanito and Paula responded 1) education, 2) health, and 3) the economy, while Elizabeth said 1) health, 2) the economy, and 3) education. Modesto Ponce, a 75 year-old published Ecuadorian author, also prioritized health and social issues above all else. Survey results showed that environmental issues receive only 20% of the first priority when compared to health, the economy, and human rights. Throughout this study, the environment was consistently ranked far lower than other political issues to Quiteños, and it quickly became apparent that political activism for Amazonian conservation is virtually nonexistent in Quito. While interviewing and surveying did reveal that many Quiteños are partially interested in the welfare of the Amazon, there does not exist a sense of urgency and/or pride to become involved in its protection. The popularized idea of conserving the megadiverse Amazon is only as new as the Yasuní ITT Initiative, which has brought such an incredible amount of political and social attention to the issue in the last few years that Ecuadorians from all four regions of the country are at least aware of its existence. According to survey responses, all respondents think the Yasuní initiative is a step in the right direction for environmental conservation. However, over half of the respondents were extremely skeptical of its success. Skepticism included comments such as, “[the Yasuní initiative] is hypocritical and inconsistent,” “it is doomed to failure if the position of the government does not change, especially the President’s,” and “the initiative is driven by politics,” implying that the initiative is not based on actual concern for the welfare and protection of the Amazon. Overall, this skepticism suggests that since Quiteños do not have considerable hope for the initiative’s success, their motivation and desire to become involved in advocacy is very small. Lack of motivation to become politically or socially involved in the initiative’s successful passage is weakened even further when beliefs exist specifically regarding politicians’ agendas having more importance than environmental welfare. In other words, Quiteños may feel as though their voice would not matter when faced with political agendas and the power and influence that come with them. Nonetheless, while skepticism exists amongst Quiteños, every person surveyed had heard of and had a base knowledge about the initiative. However, even with a large amount of media attention on the Yasuní ITT Initiative issue, Kelly informed me that no one from outside the region who does not work in the Yasuní National Park either for environmental conservation or in the oil industry, would ever make an active effort to visit the park. “I'm sure that less than 1% of all Ecuadorians have actually been inside the Yasuní.” Kelly continued to explain how even most Ecuadorians from the Oriente itself have never been inside the actual, intact rainforest and know essentially nothing about it beyond where it is geographically located: “People who live in Coca or Tena or Lago Agrio have, for the most part, never seen a monkey in the wild – and they would never consider paying to go to a place where that might be possible. That's just too far from their hometowns and there's no justification for going ‘all the way out there.’” Oil workers are also separated from the power and awe of the Amazon by chain-linked fences that keep them away from the “menacing and dangerous forest and all its creatures.” If people who live within the regions of the Amazon, and even those who work inside it, have no desire to learn about and feel connected to the Amazon, it is no surprise that the majority of Quiteños, according to this study, are culturally barricaded from it too. Kelly’s research has shown that there may be no comparison to the Tiputini area in the entire world in terms of biodiversity. However, according to the observations of Kelly and Juan de Dios, a manager at the Station living in Quito, Quiteños are generally ignorant about the gem that exists in their own country. Kelly explained how every year for Earth Day he does environmental outreach for the US government in Ecuador. A few years ago, he spoke to sets of Quiteño public school students from ages 10-17 about environmental awareness. When Kelly asked the children if they had ever visited the Yasuní National Park, it did not surprise him that no one raised a hand. However, Kelly was shocked to find that a large majority of the children had never even visited the very popular Carolina and Metropolitano parks of Quito. The bottom line is that people in Quito are very separated from Yasuní geographically, mentally, and emotionally; the "people of the Oriente" are almost as separated as Quiteños despite the fact that they would likely show more solidarity on the issue if confronted, and as a point of pride they would be more adamant. However, in general, the old psychology adage, "out of sight out of mind" applies to an overwhelming extent in this case. Various conclusions have been drawn throughout interviewing and surveying. First, it is important to acknowledge that Quiteños, overall, do have a sense of pride for Ecuador’s Amazon, and none of the interviewees denied that there should be a mobilized moral obligation to protect it, “Todos somos Ecuatorianos.”40 However, there does exist a strong cultural detachment from the Amazon, which is a phenomenon that is not just limited to Quito but also runs rampant in other major Ecuadorian cities such as Guayaquil and Cuenca. Indicators of this cultural detachment can be seen through Quiteños’ overall agreement with oil development in the Amazon (cultural), the recurring perception of the Amazon and indigenous communities that live there as the “other” (geographical), the lack of political involvement and prioritization of political issues in Quito (political), lack of desire to visit the Amazon and the Yasuní National Park, and the skepticism of the Yasuní ITT Initiative’s success (geographical/economical). One of the solutions to this detachment that every interviewee mentioned was the mobilization of younger generations. Paula has faith in the youth of Ecuador, including her own generation: “the Ecuadorian youth will have loud voices regarding oil development in the Amazon because they are living with the consequences.” Every day, Kelly witnesses his students becoming increasingly outraged at the lax regulation of oil development and the widespread Amazonian deforestation that goes along with it. Modesto is proud that his country is the first to ever give the natural world legal rights in the Ecuadorian Constitution and believes that every generation that passes has clearer ideas of conservation. When I asked Elizabeth if she had faith in younger generations to protect the Amazon, she quietly looked at her three-year-old son, as if hopefully imagining his abundantly promising future, and responded “totalmente.” In the past forty years, educators have made increasing efforts to instill a sense of appreciation and pride for Ecuadorian biodiversity in the hearts and minds of young children. According to the interviewees, many Quiteños have faith that a group of organized Ecuadorian youth who feel personally offended by the country’s disregard for the intrinsic value of the Amazon will grow to such numbers to a point that a difference will be made in the future. Now, the question is whether Ecuador will find the balance between society, economics and the environment before the Amazon, including its wildlife, medicinal potential and its indigenous people, disappears forever. 1 Rainforest Action Network, “Chevron’s Toxic Legacy in the Ecuadorian Amazon”, <http://ran.org/chevrons-toxic-legacy-ecuador>. 2 Karoline Nolso Aaen, Ecological and Sociological Impacts of Oil Exploitation in and around Yasuní National Park, Ecuador (Copenhagen: University of Copenhagen, 2006) 6-8. 3 Chris Baker, et al., Oil Pollution in Ecuador: A devised Remediation Approach (Worcester: Worcester Polytechnic Institute, 2009) ix. 4 James Rochlin, “Development, The Environment and Ecuador’s Oil Patch: The Context and Nuance of the Case Against Texaco” (Association of Third World Studies 28.8, 2011) 11-39. 12 OPEC, Organization of Petroleum Exporting Countries, “Ecuador Facts and Figures” (Annual Statistical Bulletin, 2012). 15 Rights Violations in the Ecuadorian Amazon: The Human Consequences of Oil Development, (New York, NY: Center for Economic and Social Rights, 1994) 5-11. 16 Rights Violations in the Ecuadorian Amazon. 17 Migual San Sebastián and Anna-Karin Hurtig, Oil Exploitation in the Amazon basin of Ecuador: a public health emergency, (Sweden: Umea International School of Public Health; Ecuador: Instituto de Epidemiología y Salud Comunitaria, 2003) 205-210. 19 Julie Marie Weinart, The Construction and Influence of Local Gender Roles on Practice in a Global Industry: Ecotourism in Ecuador, (Ohio: The Ohio State University, 2008). 20 Rights Violations in the Ecuadorian Amazon 6. 21 Rights Violations in the Ecuadorian Amazon 6. 22 Rights Violations in the Ecuadorian Amazon 6. 23 Rights Violations in the Ecuadorian Amazon. 25 Rights Violations in the Ecuadorian Amazon 6. 27 Rights Violations in the Ecuadorian Amazon 11. 28 Rights Violations in the Ecuadorian Amazon 8. 29 Rights Violations in the Ecuadorian Amazon 11. 30 Rights Violations in the Ecuadorian Amazon 6. 31 Rights Violations in the Ecuadorian Amazon 8. 34 Matt Finer, et al., Leaving the Oil Under the Amazon: Ecuador’s Yasuní-ITT Initiative (Biotropica, 2009) 63-66. Aaen, Karoline Nolso. Ecological and Sociological Impacts of Oil Exploitation in and around Yasuní National Park, Ecuador. University of Copenhagen. 2006. Web. 14 March 2013. Baker, Chris. Oil Pollution in Ecuador: A Devised Remediation Approach. Worcester Polytechnic Institute. 2009. Web 13 March 2013. Center for Economic and Social Rights. Rights Violations in the Ecuadorian Amazon: The Human Consequences of Oil Development. New York, NY. Center for Economic and Social Rights, March 1994. Web. 14 March 2013. “Chevron’s Toxic Legacy in the Ecuadorian Amazon.” Rainforest Action Network. Web. 14 March 2013. Finer, Matt; Moncel, Remi; Jenkins, Clinton N. Leaving the Oil Under the Amazon: Ecuador’s Yasuní-ITT Initiative. Biotropica, Duke University. 2010. Pg. 63-66. Web. 13 March 2013. OPEC, Organization of the Petroleum Exporting Countries. Ecuador Facts and Figures. Annual Statistical Bulletin 2012. Web. 7 May 2013. Rochlin, James. “Development, The Environment And Ecuador’s Oil Patch: The Context And Nuances Of The Case Against Texaco.” Journal Of Third World Studies 28.2 (2011): 11-39. Historical Abstracts. Web. 13 Mar. 2013. San Sebastián, Miguel; Hurtig, Anna-Karin. Oil Exploitation and Health in the Amazon Basin of Ecuador. Umea International School of Public Health, Umea Sweden, and the Instituto de Epidemiología y Salud Comunitaria, Coca, Orellana, Ecuador. Web. 12 March 2013. Weinert, Julie Marie. The Construction and Influence of Local Gender Roles on Practice in Global Industry: Ecoturism in Ecuador. The Ohio State University. 2008. Web. 11 March 2013. What is your name, age, and title? How long have you been living in Quito? Politically, what issues do you prioritize? The economy? Health? The environment? What do you know about oil development in the Amazon regions of Ecuador? Historical or current events. Considering the economic benefits and environmental/indigenous consequences combined, do you agree or disagree with oil development in the Amazon? Why or why not? Do you feel that tourism hurts or helps the Amazon and its protection? Why or why not? Do you have a sense of pride for the biodiversity in your country? Why or why not? Do you feel that much of the revenues generated from oil development in the Amazon regions of Ecuador are properly reinvested into the economy? Why or why not? How should accrued revenues be distributed or regulated? Living in Quito, do you feel more connected or separated from the events occurring in the Amazon currently? Does oil development in the Amazon affect your daily life? Since the Amazon rainforest is one of the most biodiverse places in the world, the “lungs of the earth”, do you witness a sense of urgency in Quito to become involved in its preservation? Why or why not? Would you say that there should be a moral obligation for Quiteños to become involved in the fight against environmental destruction? Why or why not? Where do you think the future of the Yasuní ITT Initiative is headed? Can you talk a little about the Católica Biodiversity Station, and if oil development played a significant role in it becoming less pristine? Has Tiputini seen any effects of oil development? Does oil development help or hurt your businesses? Do you see the effects of oil development on a daily basis? What role do you think the Ecuadorian youth/younger generations will play in environmental conservation of the Amazon in the future, if any? During your work, do you witness the affects of oil development on the Amazon? Have you ever experienced a situation in your work relating to the destruction of the Amazon due to oil development? How long have you been working at Tiputini Biodiversity Station? Has Tiputini experienced similar symptoms? What do you think the future of the Tiputin Biodiversity Station is? Do you think that protecting the Amazon is a cause worth fighting for? What kinds of measures does your private oil company take to ensure the protection of the Amazon, as well as any environment you might work in? What do you think needs to happen in order for oil development not to destroy the Amazon? 3) ¿En cual de las siguientes categorías se encuentra Usted? 4) ¿En Ecuador, cómo priorizaría los siguientes temas? Siendo 1 el más importante y 5 el menos importante. 6) ¿Está de acuerdo o en desacuerdo con la minería en la Amazonía? ¿Por qué? Explique. 7) ¿Explique brevemente cómo cree que debería ser utilizado, distribuido, y regulado el dinero obtenido del desarrollo del petróleo y la minería en la Amazonía? 8) Si alguna vez ha participado en activismo en contra de la explotación petrolera de la Amazonía, especifique qué tipo de activismo fue. 9) ¿Ha escuchado sobre la iniciativa de Yasuní-ITT? En caso afirmativo, cual es su opinión sobre la iniciativa? 10) ¿Cree que el turismo ayuda o perjudica a la protección de la Amazonía? Razone brevemente su respuesta. Britney Weber is an alumna from Fairfax, Virginia. She majored in International Studies and minored in Spanish. She is currently working for The Center for Strategic and International Studies in Washington. She would like to thank Dr. Michael D. Hill for his support and guidance through this project.